Pillar Triple Gauge Pod Mount. User must follow the direction given and any misuse of this product is at his/her own risk. NOTE : All of turbo parts and performance may require slight modification in order to fits perfectly. Pillar Dual Gauge Pod Mount. Crafted from the Highest Quality ABS Plastic (Acrylonitrile Butadiene Styrene). We can provide minimal support, but we will try our best to help. Canada and International Countries. FREE US SHIPPING! 30 Day Money Back & 199 Day Warranty! Mounts Three 2 1/16th (52mm) Gauge. We will try our best to reduce the risk of the custom duties. Mounts Three 2 1/16th (52mm) Gauge. Material: ABS Plastic. Color: Black. Quality Used Parts Since 1955! VERSA 14 (cluster), Htbk (Note), MPH. C Grade - The third level quality part. B Grade - The second level quality part. It is of average miles and normal condition for its age. A Grade - The highest quality part. Speed Range: 0~999 (MPH, Knots, Km/h). Switch unit between MPH(Mi), Knots(NMI) and Km/h (KM). Mileage Range: 0-999 999 (Mi,NMI,KM ). 2007 Nissan Versa Hatch C11X 1.8L. Replaces Nissan 23710-EL66B. 2009-2010 Nissan Versa SC11X & Versa Hatch C11X 1.8L. VERSA 10-11 (cluster), MPH, AT, w/CVT, ID 24810ZW83D. This part will fit these makes and models with these options. No labor warranty is provided. 2007 Nissan Versa Hatch C11X 1.8L. Replaces Nissan 23710-EL55B. Black 52mm Auto A Pillar Pod 3 Triple Gauge Holder Mount Pod Bendable Universal. 1 x 3 Holes Mount Gauge Holder. Color:Black （as picture shown）. We will reply you within 24- 48 hours. Universal Fit the left hand drive Vehicles. Pillar Triple Gauge Pod Mount. Holds Three/Triple 52mm Gauges. Crafted from the Highest Quality ABS Plastic (Acrylonitrile Butadiene Styrene). Stylish Design Giving Your vehicle An Aggressive Performance Racing Look. 2PCS Oil or Water Temperature Temp Auto Gauge Sensor Sender Probe 1/8 NPT. Universal Oil or Water Temperature Temp Auto Gauge Sensor Sender Probe 1/8 NPT. 1/8 NPT Thread. Temperature sender/temp sensor for water guage or Oil guage Water Temperature / oil temperature sender /sensor, temperature sender/temp sensor by high quality. Universal 2" 52mm LED Light Car Pointer Oil Temperature Temp Gauge 50-150℃. Numbers and pointer clearly show the oil temperature. 1 x Oil Temperature Temp Gauge. Power: 12V DC, Max. Read: 50 - 150℃. 1x Water temp Gauge. Water temperature alarm: 95 -110℃. 1x Water temp sensor. Suitable for 12V,24V Car universal. Cable length :approx.300cm. 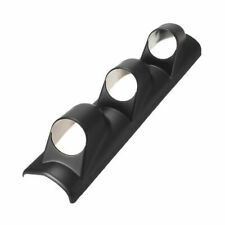 Pillar Triple Gauge Pod Mount. Crafted from the Highest Quality ABS Plastic (Acrylonitrile Butadiene Styrene). NOTE : All of turbo parts and performance may require slight modification in order to fits perfectly. In Business Since 1973! 90 Day Warranty! Free Shipping! Carbon Fiber Pillar Dual Gauge Pod Mount. Universal CUTTING POD MOUNT IS REQUIRED TO FIT ON YOUR PILLAR . Crafted from the Highest Quality Carbon Fiber Style. We can provide minimal support, but we will try our best to help. 1/8 NPT Thread. Temperature sender/temp sensor for water guage or Oil guage Water Temperature / oil temperature sender /sensor, temperature sender/temp sensor by high quality. Temp Range 0°C to 150°C. Carbon Fiber Dash Mount Triple Gauge Pod. Holds Three/Triple 52mm Gauges. Crafted from the Highest Quality Carbon Fiber Style. Stylish Design Giving Your vehicle An Aggressive Performance Racing Look. 2008-2010 Nissan Versa SC11X & Versa Hatch C11X 1.8L Manual Transmission. The third level quality part. - The second level quality part. It is of average miles and normal condition for its age. - The highest quality part. It is of low miles and/or exceptional condition for its age. Oil Temperature Gauge monitor engine oil temperature, ensuring motor oil does not break down causing harmful wear and tear to your engine. 2" (52mm) Oil Temperature Gauge. Oil Temperature Reading from 100 to 300 Degrees Fahrenheit. Carbon Fiber Pillar Dual Gauge Pod Mount. Universal CUTTING POD MOUNT IS REQUIRED TO FIT ON YOUR PILLAR . Crafted from the Highest Quality Carbon Fiber Style. Requires Modifications To Mount . Carbon Fiber Pillar Triple Gauge Pod Mount. Crafted from the Highest Quality Carbon Fiber Style. Stylish Design Giving Your vehicle An Aggressive Performance Racing Look. We can provide minimal support, but we will try our best to help. Display range: 0-99999.9 hours. 1, DO NOT open any case in Resolution Center;. In this case, pictures that can clearly show the problem are NECESSARY. 90 Day Money Back Guarantee! In Business Since 1950! Black 52mm Auto A Pillar Pod 3 Triple Gauge Holder Mount Pod Bendable Universal. 1 x 3 Holes Mount Gauge Holder. Universal Fit the left hand drive Vehicles. Color:Black （as picture shown）. We will reply you within 24- 48 hours. Carbon Fiber Pillar Triple Gauge Pod Mount. Holds Three/Triple 52mm Gauges. Crafted from the Highest Quality Carbon Fiber Style. Stylish Design Giving Your vehicle An Aggressive Performance Racing Look.